Asus Padfone Contraption makes it feasible for the user to dock your Android smartphone into a screen shell and thereby covert it into a tablet. According to recent rumors, Asus has a plan to showcase it at MWC 2012 which is in February. In the beginning Asus was testing the Padfone with Qualcomm’s upcoming Snapdragon Processor with the 28nm Kraite core but now company has made some changes. Recent Rumors suggest that Asus Padfone will be powered by a NVIDIA’s Tegra 3 Processor. This news seems to be logical exactly when company has used this chip in Asus Transformer Prime Tablet. Asus Padfone is surely one of the best concept as it has combined a smartphone and tablet function. It should be an affordable solution for a person who want to get a smartphone along with a tablet. A person just need to have a Padfone and through it he can explore his smartphone’s videos and other content on a bigger display of tablet. 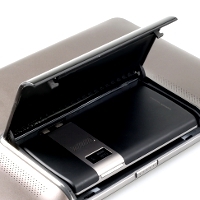 Docking a phone into a tablet is really an amazing concept and we can predict that Asus will get a design award for it.